This week, the world of Star Wars expands, and there's no turning back. With two named and one unnamed Star Wars Story films on the books at Lucasfilm, it's clear they're going full speed ahead on the idea of bringing new, non-Saga films to the Star Wars franchise. That means movies that exist outside of the core "Skywalker Saga" story that has made up every film thus far - that story will stay in the "Episode" films, currently coming out on odd years, while the new standalone films hit in even years. But for all that to happen going forward, Lucasfilm absolutely had to execute on Rogue One: A Star Wars Story, their first effort in the expansion. Luckily, they absolutely have executed. Rogue One doesn't just expand the Star Wars universe in an exciting way, it tells a singular, stand alone tale that still enriches the overall narrative of that universe. This movie fought an uphill battle, and continues to, all the way up to release. With the immense popularity of Star Wars: The Force Awakens in 2015 (and carried over into this year), teaching the general public that this new movie takes place 35 years earlier and with a completely different cast was a difficult task. 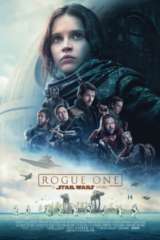 From the start of Rogue One, with the lack of the traditional "crawl," the different soundtrack (with a fantastic score by Michael Giacchino, which takes some getting used to at first), and the break-neck pace (two timeframes and 5 planets in the span of the first 25 minutes), there's a lot to take in. This isnt a movie to watch casually, or a traditional popcorn flick. It's a film to watch intensely, pulling in every bit of information as tightly as you can. In that sense, the pace itself is a metaphor for war: it's quick, it's messy, and there's about a million things going on all the time. It certainly feels intentional, a choice by director Gareth Edwards; you're not allowed to learn too much about any one character or location or even cause, unless absolutely necessary for the mission. That's war, and it's a different approach for the Star Wars franchise. At the same time, the personal relationships and individual characters are what made this movie shine. In war, you don't need to know every detail of a person's life to know whether you're willing to fight alongside them, to die for, or with them. In that aspect, the relationships here were 100% natural and realistic. There's some mistrust, there are some questionable decisions, and eventually they come around to figure out that this ragtag group must work together, or they're all screwed. It's that simple. As much as the big set piece moments are a blast and memorable - and boy are they - the characters are what stuck with me. I felt more for individual characters in this film than probably any other Star Wars film. Chirrut Îmwe and K-2SO are the two characters I went into the film expecting to love (and the two that people talked about the most after the press preview at Skywalker Ranch last week), and they definitely come through in the film. 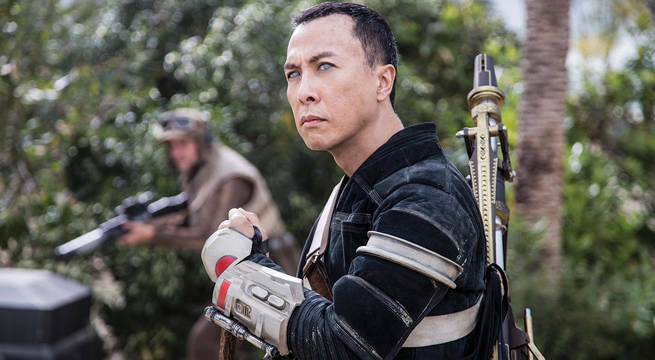 Chirrut, played by Donnie Yen, is a delight on every level. He's funny, he's zen-like, he's a mystery and straightforward. He also happens to be a total badass, and has two of the top five moments in the entire film. "I am one with the Force, the Force is with me." K-2SO, a 7-foot tall droid played in performance capture by Alan Tudyk, arguably has the most heart of any character in Rogue One. There's a unique sense of duty, of loyalty, but also of repentance, of some robot approximation of sadness. He can't ever repay Cassian for setting him free, or ever make up for whatever he was forced to do when built by and working for the Empire. He is also hysterically funny, with line after line that lightens the mood. Baze Malbus was surprising, in his stoic nature (and probably less than ten lines delivered by Jiang Wen) it still felt like you knew his entire backstory and character. Bodhi Rook (Riz Ahmed) was the example of the hell of living under the Empire's rule - and of the evil on both sides of the war; like Kaytoo, he had some real, palpable sadness to him. Cassian Andor was a pure soldier, struggling with the morality of war versus the end goal. Being a veteran of a foreign war myself, I was constantly struck by how realistic Cassian's responses to war were. 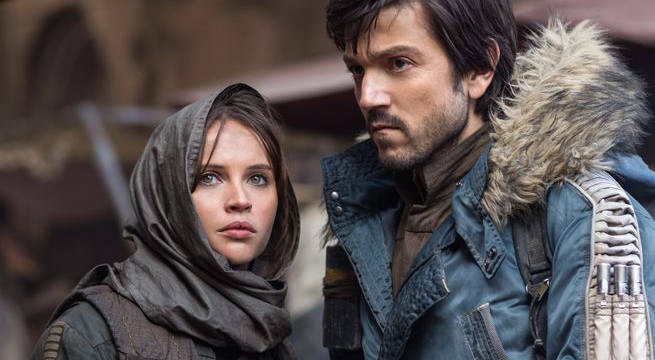 Unfortunately, if there's one character complaint from the core group, it rests with Jyn (Felicity Jones). This was the only character who it felt like was lacking backstory, even though we technically had the most backstory for her. Not sure what didn't strike correctly there; Jones' acting was great, and the interpersonal relationships formed between her and the other characters made upf ro a lot of this feeling, but there was still a strangeness to her. On the villain side, Ben Mendelsohn is just a dream come true as Orson Krennic. If he could go ahead and make a film version of the prequel novel Catalyst and every other second of Krennic's life up to this point, that would be great. Fans of Tarkin will be happy - not just because he's in the film, but because Krennic is a worthy successor in that line of characters. Darth Vader's presence in the film is limited as forewarned, but what a presence. Vader fans will not be disappointed in seeing the Dark Lord of the Sith on screen. There's even a one-off line about Vader that so succinctly describes him and his terrifying power; it's perfect. Ultimately, Rogue One is definitely a movie for Star Wars fans first, and for general moviegoers second. Despite some responses to the film, it felt to me like a movie that general audiences - even those who don't know Star Wars at all - would enjoy. Sure, die-hard fans are going to better comprehend the in-references and jokes and a few of the major moments, but general fans will love the relationships, the major set piece moments (including possibly the coolest single space battle moment this side of the first Death Star exploding), as well as the weight of the film. The third act is probably the best single act of a Star Wars movie yet. You'll leave the movie thinking hard, breathless, and as Lucasfilm president Kathleen Kennedy warned at the press junket, likely with a lot of tears. If the main goal for Rogue One: A Star Wars Story was to create something different in the franchise, bringing a true war movie to this world and establishing that there's more to it than the Skywalker family, consider that goal 100% achieved. While there are a few missteps and things that can be picked apart, ultimately, none of those things took away any level of enjoyment. This is a tremendous film, a great start to the standalone corner of the franchise, and a great Star Wars movie. Are you excited for Rogue One: A Star Wars Story? Get your tickets here!